Every year in April, the Office for Victims of Crime helps lead communities throughout the country in observances of National Crime Victims’ Rights Week. 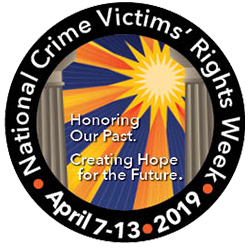 This year National Crime Victims’ Rights Week is being observed April 7-13, 2019. In honor of National Crime Victims’ Rights Week, this year's event will feature a compelling message from victims of federal crimes who have lost a loved one to opiate overdose, educate the community about the opiate epidemic and discuss the mission of the United States Attorney’s Office Heroin Education Action Team (HEAT) in an effort to reduce the growing harm to families and communities caused by heroin/opiate abuse. This project is sponsored by the U.S. Attorney’s Office for the Eastern District of North Carolina, and members of the Interagency Council; City of Durham Police Department, Raleigh Police Department, Federal Bureau of Investigations, H.A.L.O.S., NC Attorney General’s Office, NC Department of Public Safety, NC National Guard, NC Victim Assistance Network, and US Postal Inspection Service. The Auditorium of the Archives and History/State Library Building is located in downtown Raleigh between the North Carolina General Assembly and the North Carolina Executive Mansion at 109 East Jones Street. The event will be held in the Auditorium. I.D. badges must be worn at all times. A building entrance ramp for wheelchairs is located at the east end of the building. Restrooms are located just outside the auditorium. Smoking, eating and drinking are PROHIBITED in the auditorium. From the Raleigh-Durham International Airport, take Glenwood Ave. (U.S. 70) into downtown. Turn left on to Jones St. The Archives and History/State Library Building is on the right, between Wilmington St. and Blount St.
Take U.S. 64 West on New Bern Ave. (which changes to Edenton St). Turn right onto Person St. for one block, turn left onto East Jones St. for one block, and The Auditorium of the Archives and History/State Library Building is on the right, between Wilmington St. and Blount St.
From I-40 , take exit 299(Person St.). Proceed north for two miles. Turn left on to East Jones St.. for one block, and The Auditorium of the Archives and History/State Library Building is on the right., between Wilmington St. and Blount St.
From U.S. 70 East, take I-40 to exit 299 (Person St.) and turn left on to East Jones St.. for one block, and The Auditorium of the Archives and History/State Library Building is on the right, between Wilmington St. and Blount St.
From I-40 East, take exit 289 (Wade Ave.) to Capitol Blvd. Continue on Capitol Blvd. and turn left on to East Jones St. The Archives and History/State Library Building is on the right, between Wilmington St. and Blount St.
From U.S. 64 East or U.S. 1 North, take Western Blvd. turn left on to Wilmington St., turn right onto East Jones St. The Archives and History/State Library Building is on the left, between Wilmington St. and Blount St. Paid parking is available in the lot directly across the street from the Archives and History/State Library Building. During the week, the rate for parking is $2.00 an hour. Metered parking is also available on East Jones and Edenton. ceremony in order to remember and honor crime victims through name submissions, written expressions and/or photos. Please complete the attached form and return it to the contact below. Mailed submissions will NOT be returned.